Tibetan Mastiff sold for $1.6 million in China. One of the world’s most expensive dogs. 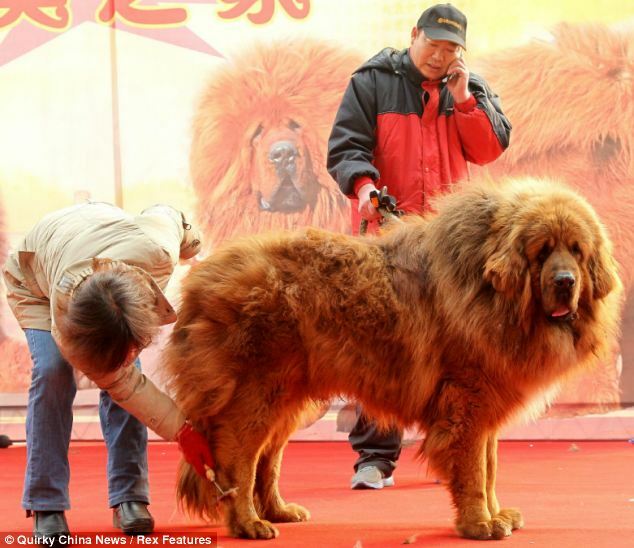 Emperor, a Tibetan Mastiff, went on sale this week for a staggering 10 million Yuan ($1.6 million). With his thick double coat, Emperor was one of more than 1,000 Tibetan mastiffs from across China appearing at a two-day dog trade show in Shijiazhuang, capital of northern China’s Hebei Province, this week. The average price being asked for one of the dogs was around 1 million Yuan ($160,000). The Tibetan Mastiff has become a status symbol in China because they are thought to be holy animals, blessing their owners’ health and security. But his owner believes Emperor is a particularly handsome catch, offering him out for breeding purposes with a single mating costing half a million Yuan ($80,000). The Tibetan Mastiff is an ancient breed of dog, originating from the nomadic cultures of Central Asia.